As parents we want the very best start for our children, and for many that incudes a christening. Your child is precious to you and precious to God, and we delight in welcoming families for this important and joyful day. During a christening your child will be baptised with water - a sign of life and the new start that God offers all of us. It's not just a special event, though - it's the start of an amazing journey of faith, a step of commitment for you all to take together, and for preparation as well as getting to know you all we would meet up to talk about some of the bigger questions of life and what faith might mean to you. 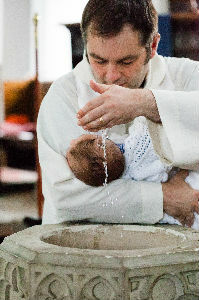 There is a level of commitment to baptism - it's a shared journey - but we also offer a Thanksgiving service, a simple but lovely service of prayer and blessing, if perhaps you feel it isn't the right time to baptise your child. We would be happy to discuss the possibilities with you, so please do get in touch. Of course the Christian faith is not just for children so if you are an adult or teenager and would like to discover more about Jesus and the difference that He can make we would be delighted to hear from you. The Church of England have a website to explain more about christenings. Click here to discover more.